Field Marshal Arthur Wellesley, 1st Duke of Wellington, KG, GCB, GCH, PC, FRS (1 May 1769–14 September 1852) was a soldier and statesman. He was one of the leading military and political figures of 19th-century Britain. 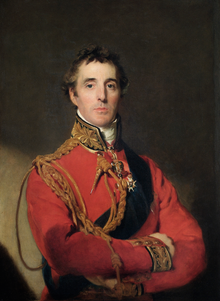 His defeat of Napoleon at the Battle of Waterloo in 1815 put him in the top rank of Britain's military heroes. In 2002 he was number 15 in the BBC's poll of the 100 Greatest Britons. Wellesley was born in Dublin into a wealthy Anglo-Irish aristocratic protestant family. Starting as an ensign in the British Army, he served well in British India and in the Napoleonic Wars, mostly in Spain, where he reached the rank of Field Marshal. He became a Duke when Napoleon was exiled to Elba. Wellington is often compared to the 1st Duke of Marlborough. They had many things in common, including being in politics after a highly successful military career. Wellington was twice Tory Prime Minister of the United Kingdom. He was one of the leading figures in the House of Lords until his retirement in 1846. He remained Commander-in-Chief of the British Army until his death. This page was last changed on 30 June 2018, at 13:36.